This webinar took place on October 31, 2012. The recorded version is no longer available. Coronal Mass Ejection — even the name sounds scary. developed to mitigate its effects. The event was presented by Inside GNSS magazine and sponsored by NovAtel. It featured three experts: Anthea Coster, MIT Haystack Observatory, Joe Kunches, National Space Weather Prediction Center and Demoz Gebre-Egziabher, from the University of Minnesota Aerospace Engineering and Mechanics Department, who moderated the discussion. Product designers, system integrators, application developers, equipment manufacturers, and engineering professionals and users who need a high level of assurance in access to high-precision GNSS positioning and timing will benefit from listening to the recorded version. ANTHEA J.COSTER, atmospheric scientist at the Haystack Observatory of the Massachusetts Institute of Technology near Boston. She has worked with GNSS since 1985. JOE KUNCHES, senior scientist at the U.S. NOAA National Weather Service’s National Space Weather Prediction Center in Boulder, Colorado. 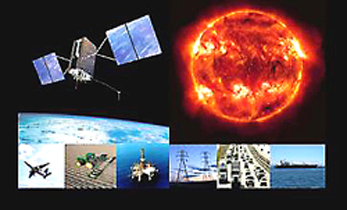 He works with issues that directly affect GNSS users of space weather services. DEMOZ GEBRE-EGZIABHER, associate professor of aerospace engineering and mechanics at University of Minnesota-Twin Cities, USA. His research area is in navigation, guidance, and control of aerospace vehicles.